At the end of my last post, I realized that I had about 5 weeks before I start tapering for the Baltimore Marathon. I really wish I had thought that way all along. I’ve been saying for weeks that I need to be above 30 miles, and the last two weeks, I came in at 29. My longest run thus far is 15 miles, and I had a successful Leesburg 20K. Cross-training with stand-up paddle-boarding is becoming an invaluable asset as I am starting to see my paces drop and they are starting to feel easy. It’s hard to want to run when I’d rather work through some things going on off the trail; the kind of things where stillness is what I need so I can think. But this is literally when things need to be heating up, so I can’t back off now. I’ve got to get things done. I’m going from having run two 29-mile weeks in a row to running a 41-mile week. Yes, I know how that looks. No, I don’t think I will get there. Yes, I am panicking, and no, I don’t know what I am doing. I suppose I’m just going to run what I can each day and let whatever happens happen. Secretly, I won’t panic as long as I can reach 36 miles this week. Sunset on the C & O Canal Towpath near Georgetown. Monday: 3 easy pace miles at 10:33 average pace. The day was supposed to be up near 90, so that meant there was only one thing on my mind: paddle-boarding. After work, I got home and decided I would run 1.5 miles to the boathouse, paddle-board for as long as the sun was up, and run 1.5 miles home. All I wanted was to be on the water. I didn’t feel like running, but I figured this would be the best way to do both. Imagine my dismay when I got to the boathouse after having run 1.5 miles at about 6:45 just to be told the last boats of the day leave at 6:30 instead of 7PM now because the days are getting shorter. I hate that summer is so short. It just started. There’s already pumpkin beer on the shelves, all the kids are heading back to school, and people are whining about the heat because they can’t be patient enough for pumpkin spice lattes to just enjoy the sun and the green on trees and the warmth outside and all that it has to offer. Just a month ago, boats were leaving at 8PM and now we lost a whole hour and a half. I hate that summer only gets 3 months and then it’s cool and cold and then cool before it’s warm again. Remind me to move somewhere where I can be close to water and it’s warm year-round. Tuesday: 5 easy pace miles at an average 10:11 pace. For Tuesday’s run, I decided that I needed to run somewhere flat. I felt like I had run a few too many hills and I needed to just be on solid ground for awhile. 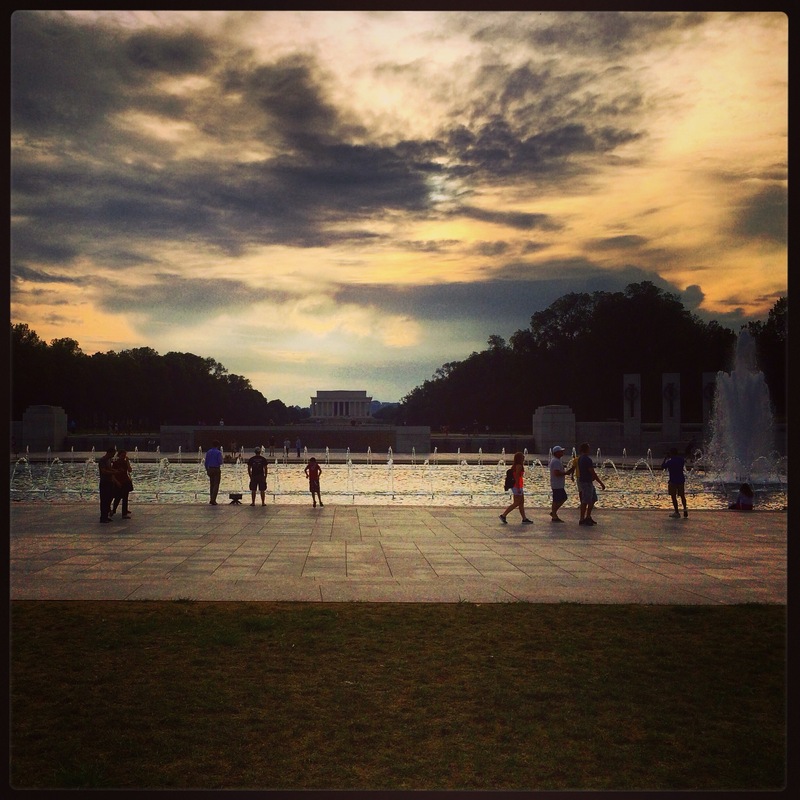 I decided to run where I don’t usually run much anymore: the National Mall. I love, love, love running the Mall, but DC is taken over by tourists for 5 miserable months every year and that makes running on the Mall an exhausting venture for us locals. You end up weaving through herds of dazed people who walk on the wrong side of the sidewalk or take up the whole sidewalk, and dodging people who stop or jump in front of you to take a picture or don’t walk in a straight line. I’ve ruined pictures of people standing in front of monuments because their photographer stands 25 feet away, leaving little room for people to run behind them as everyone else walks around them. I once knocked over a kid because he darted in front of me to chase a squirrel when his whole family was walking on my side of the sidewalk. I’ve yelled things as I run past people, like “Move it!” or “Watch out!” or “Your other left!” One time I yelled a rhyme as a group of oncoming tourists refused to move over as I came charging toward them: “You better let me through or I will run into you!” After enough of that, you feel like a terrible person, even though most of the time they’re in the wrong for not following basic rules of sidewalk etiquette, and it just wears you down. Tuesday was definitely a good reminder of why I took a break from running there. As I was running, I kept getting a wave of nausea that wouldn’t leave me alone. 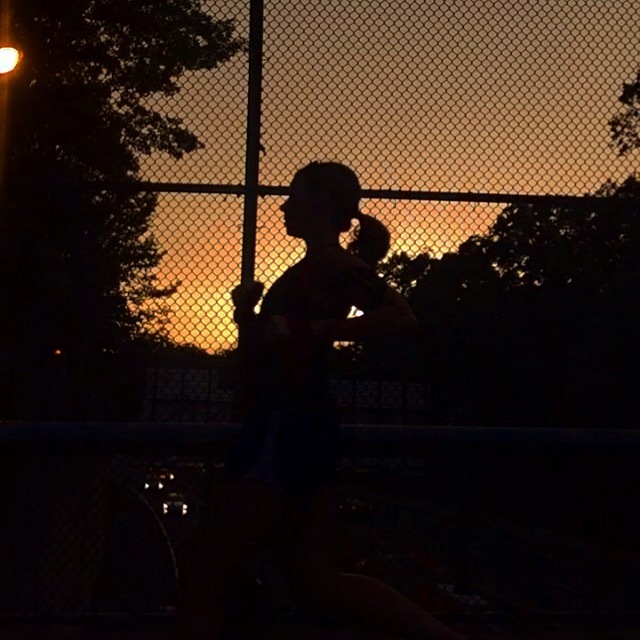 It was a really hot evening, too– heat index above 90– but I only kept running when I heard one girl say to her running partner, “One of the great things about running here is that there are other runners. It’s so motivating.” How could anyone quit after hearing that? The end of tourist season is the only reason I will be glad that it’s fall. Wednesday: Rest day. Today makes about 5 straight weeks of taking a rest day on a Wednesday. I’m starting to wonder if this is working better for me than taking a rest day on a Friday. My weeks are much busier than Fridays anyway. I didn’t purposely intend to let this happen– frankly, walking home in 91-degree heat and humidity was just too much for me. I can handle DC summers, but today just felt particularly oppressive. I swear some days that I’m going to wake up early to run, but I think I really just need to put a cork in it and stop trying already. Thursday: 4 easy pace miles at an average 10:20 pace. So, knowing that I had to make up a 7 medium-effort mile run, I figured Thursday should be great because my legs would be fresh from Wednesday’s rest day. However, there was a chance of severe weather in our area and it hasn’t really rained since June when it rained nonstop almost for days. Also, I admit that I was really psyching myself out. The pressure is building to get my mileage done in what feels like a short amount of time to do it. 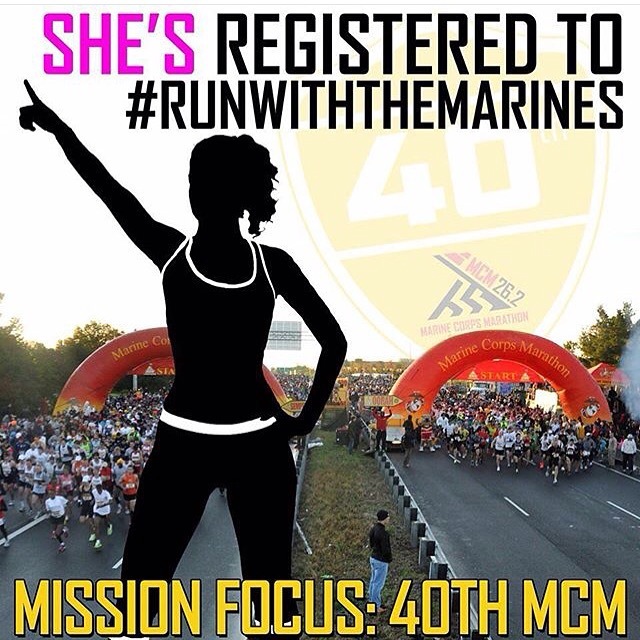 I have yet to breach 30 miles a week in marathon training, so I’m really getting nervous that I am not doing enough. Even as I am getting critical runs done– specifically my long runs and medium effort runs– the fear in the back of my mind is that I am not properly ramping up the effort. Like, I’m doing a lot of running but not a lot of training. I don’t know. Tonight’s 4-miler was run on a hilly course at an easy pace, but I feel like it wasn’t enough. Friday: 5 easy pace miles at an average 10:04 pace. Some days, running is a massive chore. Your heart is just not in it, and you’d rather do anything else. That was my Friday. So, I bargained with myself a little: switch my 7 medium-effort miles with my planned 6-miler, just run 5 miles and add the extra mile onto your 7-miler and make it an 8-miler. Complicated, but I was REALLY not in the mood to run. But I also couldn’t stand the thought of finishing a week of training under 30 miles this week, so I had no choice but to get it done. I also had left a pizza I’d gotten for lunch in the refrigerator at work, and I needed it to carb up for a weekend of running, paddle-boarding, and skydiving (you read that right). 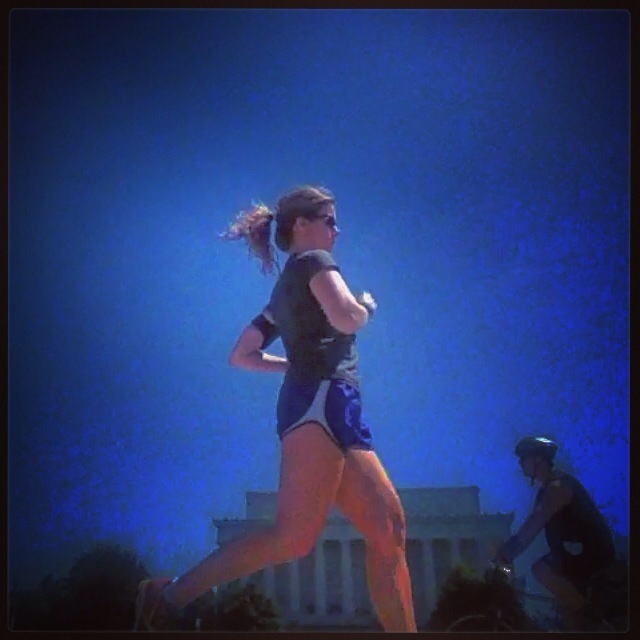 So, I decided to run the route that would take me to the National Mall, since my office is about half a mile from there. I was crabby the whole time; totally grouchy. But I admit that I was also itching to really take off and run hard. I felt like my 10:00 average paces were just a little too easy, but I maintained pace because I knew I had a heavy weekend of running ahead of me and very little time to recover. I was rewarded with quite an amazing sunset that I got to see on the National Mall and from the rooftop of my office. See, good things happen when you run! Bluest of skies over DC on Saturday! Saturday: 5 easy pace miles at an average 10:24 pace; 3 sets of 15 mountain-climbers. I went to bed on Friday in relative denial that I had 16 miles to run the next morning. Throughout the night, however, I woke up several times with stomach cramps. I slept horribly as a result, and yes, I did oversleep my alarm. I had plans that evening, so I had to run something though. I didn’t get out there until about 11AM. I knew it would be hot, and it was, but I just focused on running an easy pace and getting what I could do done. I also rationalized that I could run the remaining 3 miles tomorrow after my long run and on my way to the boathouse. It seemed totally do-able. I love how active Washington, DC is on the weekends. As I ran, I saw tons of boaters and kayakers on the river, numerous bikers and other runners, and I passed some sand volleyball courts that were filled to the brim with players and games. 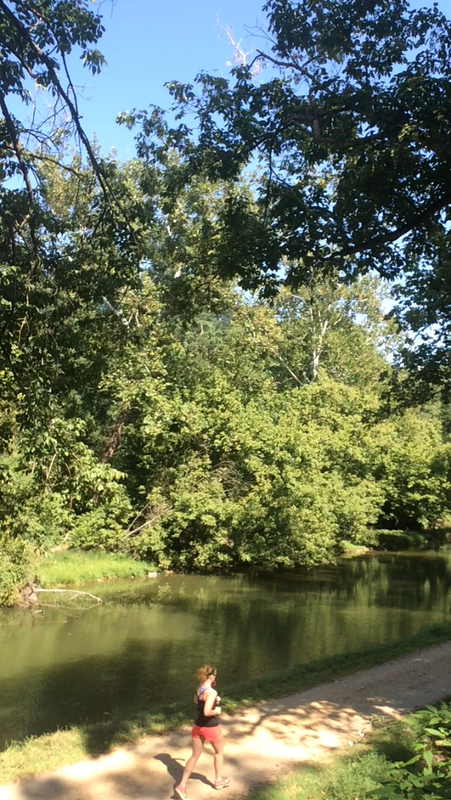 It was a perfect summer day– not a cloud in the sky, not terribly humid, mid-80’s that felt tolerable and pleasant. The last mile completely tanked my average, however. I basically started at the foot of the hill in Rosslyn and ran up it for about a mile. I had to stop and walk at mile 4.85– the sun was hot on my face, there was no downhill to be had. When I started walking, my pace average, which was about 11:34, dropped to 11:41. I wondered how much better it would have been if I had kept running. I know I needed hill training, but that hill took me down. It wasn’t even a fight I wanted. I don’t plan to run up that hill pretty much ever again. Sunday: 10 miles at an average 10:19 pace; 2 hours of stand-up paddle-boarding. Apparently, skydiving gives you an incredibly sore back. That and the impacts of a massive adrenaline rush wearing off left me with little sleep and feeling as stiff as boards the next morning. I woke up in total denial that I actually had to run 16 miles. There was just no way I could accomplish that feeling the way I did. I hung around at home for hours, watching TV, hinging on the verge of sleep, hydrating for what I don’t know and praying that the ibuprofen would hurry up and kick in. I didn’t actually get there until almost 3PM that day. I knew it would be hot, I knew it would be hard mentally to run in mid-80’s with bright sun on my face. I decided it was a price worth paying to get much-needed rest. 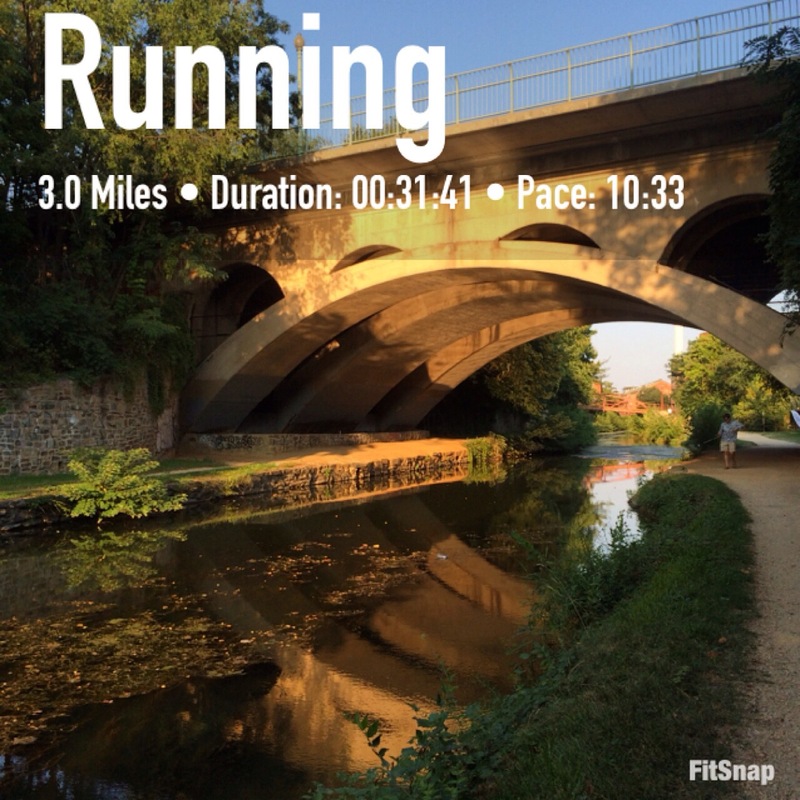 But I didn’t deserve to be punished for it, so I chose to run the Capital Crescent Trail because it’s quite shaded and cool. It was a really great call. I didn’t know what kind of distance I would be capable of running, so I started bargaining: run at least 8 miles so you can be above 30 miles for the week, it’d be great to do two more and you’ll be at 32. If you can get to 14 miles, you’ll be at 34 miles this week, and if you can somehow do 16 miles, you’ll end the week at 36 miles. I took a very slow, very easy pace. I didn’t care where it fell on my goal pace range– I just wanted the mileage. Taking a run as slow as I did made it feel actually quite enjoyable. I tried not to think about how sore I was, how long 16 miles felt when I felt this way, what would happen if I failed. I just let my legs do the work and did my best to stay in the mental sweet spot of “Yes I can” and “I want to.” The miles slipped past me like sand through fingers; definitely the kind of run that keeps you coming back for more. I did feel like I could have kept going to 12 miles or maybe even 14, but my Garmin was running critically low on battery. It kept bleeping at me during the last few miles. I called it a day at the 10th mile, happy that I was above 30 for the week and that I did a double-digit run that was actually one of the more pleasant runs of my training season when I was feeling as sore as I was. I topped off one of the coolest weekends of my life with 2 hours paddling the Potomac River. Life, right now, is a total beach. Recap: I made it past 30 miles in a week! Yippee for me! I definitely feel comfortable staying above 30 miles for the next 7 weeks. While I have a little ground to make up in terms of long run mileage, I can easily slip in a 16 and 18-miler before I hit my two scheduled 20-mile runs in September. I’m not worried about that. Overall, it was a good week. I know my goal was lofty, I know my secret goal was on the edge of lofty, but I ran what I could. In the end, that might be the difference between injury and burnout.